Anders Fogh Rasmussen has built an international consultancy that has experience on the frontline of international politics, diplomacy, and communications. Our head office is in Copenhagen, but we work across key decision centres in Brussels, Berlin, London and Washington D.C.
We operate across a broad spectrum of political domains; analyzing, shaping, influencing, and communicating on behalf of our clients in Europe and the United States. Our clients include international consulting firms, major companies, and foreign governments. 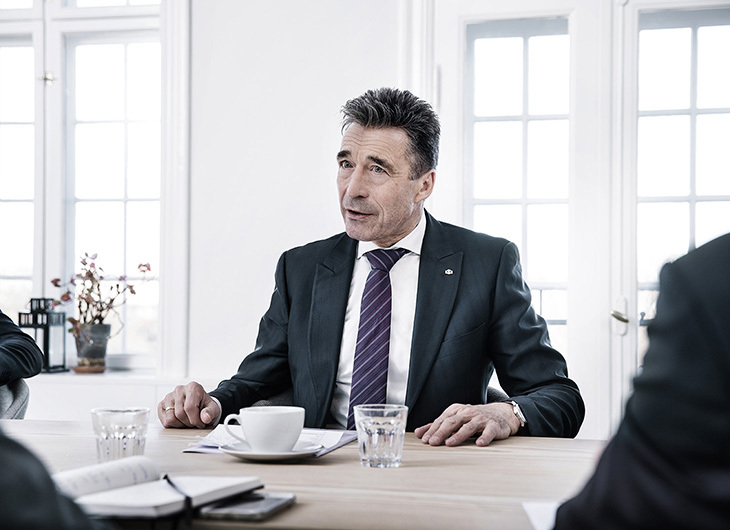 Rasmussen Global was founded in October 2014 by Anders Fogh Rasmussen. Mr. Rasmussen served as Prime Minister of Denmark from 2001 until 2009, during which time he held the Presidency of the European Union and negotiated the joining of 10 new members. In 2009 he was appointed Secretary General of NATO, a position he occupied until September 2014. As one of the few international leaders combining experience from the top decision-making level in Denmark, the EU and NATO, with a high profile across the Atlantic, Mr. Rasmussen is in a unique position to advise clients on transatlantic issues, international affairs and public policy management. Rasmussen Global offers a broad range of services to help our clients understand and shape the best possible outcome in complex public policy environments: analysing political risks, formulating strategic advice, connecting and influencing key stakeholders, and executing public affairs campaigns in Europe and the United States. Anders Fogh Rasmussen has assembled a broad team of public policy professionals with experience of advising business and political leaders as well as public policy, campaigns and communications specialists. Anders Fogh Rasmussen has been at the centre of European and global politics for over three decades as Secretary General of NATO, Prime Minister of Denmark, Danish Minister of Economic Affairs, and, last but not least, as a leading Danish parliamentarian. Anders Fogh Rasmussen began his political career in 1978, becoming the youngest member of Parliament in Denmark at the age of 25. He was promoted to Minister of Economic Affairs in 1990 and became Prime Minister of Denmark in 2001. He held this position until 2009 when he was appointed Secretary General of NATO. During his tenure, he developed a Strategic Concept which sets the Alliance’s core priorities for the future. In response to Russia’s aggression against Ukraine, he initiated a “Readiness Action Plan”. On October 1st 2014 he established Rasmussen Global and in June 2016 he was appointed advisor to the President of Ukraine, Petro Poroshenko. Anders Fogh Rasmussen holds a M.Sc. in Economics from the University of Aarhus. Fabrice Pothier has over 15 years of experience in leading international public policy campaigns and strategic communications efforts. Before joining Rasmussen Global, he served as Head of Policy Planning for two successive NATO Secretary Generals – Anders Fogh Rasmussen and Jens Stoltenberg. During this time, he developed some of the Alliance’s most consequential initiatives and wrote some landmark speeches and articles. Prior to this, Pothier founded Carnegie Europe as part of the Carnegie Endowment for International Peace, which quickly became one of Europe’s leading think-tanks. He was the co-founder of the International Council on Security and Development where he led global advocacy campaigns on public health and security issues. He started his career in London as a senior risk analyst for Japanese energy group Osaka Gas. Fabrice Pothier holds two Masters degrees in communications and politics from the UK and France, and speaks French, English and Spanish. Maria Duelund is an experienced professional within the fields of general management and leadership, combining 15 years of experience both in the private sector as well as the military. Before joining Rasmussen Global, Duelund worked on a range of strategic, operational and organizational projects in the pharmaceutical industry. Previously, she worked in management consulting, providing international companies with advice regarding process optimization, supply chain management, organizational development and market penetration. Maria Duelund is a trained military interpreter in the Russian and Serbian languages. In 2003/2004, she was deployed to Kosovo as part of NATO’s peace-support operation. Maria Duelund holds a Bachelor degree in International business from Copenhagen Business School and is 1st Lieutenant in the Danish army. Alexander Vershbow is an American diplomat and former Deputy Secretary General of NATO. Mr. Vershbow has had a long career in the State Department. From 2005 to 2008 he was United States Ambassador to South Korea. Prior to this, he was ambassador to Russia from 2001 to 2005 and the ambassador to NATO from 1998 to 2001. In March 2009, Mr. Vershbow was nominated by President Obama as Assistant Secretary of Defence for International Security Affairs, a position that holds responsibility for US policy towards NATO. He held this position until 2012 when he took the position of Deputy Secretary General of NATO, becoming the first American in this position. Alexander Vershbow holds a Bachelor’s degree in Russian and East European Studies from Yale and an MA in International Relations from Columbia University. For his work with NATO, he was awarded NATO’s Distinguished Service Medal and the State Department’s Distinguished Service Award. Toomas Ilves has had a long career in European politics serving as the fourth President of Estonia, between 2006 and 2016. Mr. Ilves worked as a journalist at Radio Free Europe before being appointed Estonian ambassador to the United States, Canada and Mexico in 1993. In 1996, Mr. Ilves was appointed Estonian Minister of Foreign Affairs. He held this position until he resigned in 1998. He was then appointed Foreign Minister again in 1999 serving until 2002. Mr. Ilves supported Estonian membership in the European Union and succeeded in starting the negotiations which led to Estonia joining the European Union in 2004. In 2004, Toomas Ilves became member of the European Parliament and was elected President of Estonia in 2006. He was re-elected in 2011. Toomas Ilves holds a bachelor’s degree in Psychology from Columbia University and a master’s degree in the same subject from University of Pennsylvania. Mr. Ilves speaks fluently English, German, Latvian and Spanish besides his native Estonian. Birger Riis-Jørgensen held senior positions in the Danish Foreign Service for many years, i.a. as Middle East department head and then undersecretary for Asia, Africa and Latin America. He was appointed State Secretary for foreign trade in 2000. Under his leadership, several public sector organizations were merged into the Danish Trade Council which became a key partner for Danish businesses abroad and for foreign investors in Denmark. In 2006 he was appointed ambassador to the UK. In 2011 he moved from London to Rome and served as the ambassador of Denmark to Italy until 2016. After he retired from diplomatic service Riis-Jørgensen continues to work as an advisor i.a. to the Danish Foreign Service, through his own consultancy firm. Birger Riis-Jørgensen holds an MA in History from the University of Copenhagen, where he also lectured in international politics before becoming a diplomat. Pierre Vimont was the first Executive Secretary-General of the European External Action Service (EEAS), from December 2010 to March 2015. During his thirty-eight-year diplomatic career with the French foreign service, he served as Ambassador to the United States from 2007 to 2010, Ambassador to the European Union from 1999 to 2002, and chief of staff to three former French foreign ministers. He holds the title of Ambassador of France, a dignity bestowed for life to only a few French career diplomats. Pierre Vimont served as the special envoy for the French initiative for a Middle East Peace Conference from March 2016 to January 2017. Previously, he had been nominated the personal envoy of the president of the European Council, Donald Tusk, to lead preparations for the Valletta Conference between EU and African countries to tackle the causes of illegal migration and combat human smuggling and trafficking. Olaf Böhnke has more than 15 years of experience as a foreign and European policy expert with a research focus on European foreign policy and Germany’s role in Europe. Before joining Rasmussen Global, he was director of the Berlin office of the European Council on Foreign Relations (ECFR). During this time, he established ECFR as one of the leading think tanks in Berlin. Prior to this, he worked as Director of the Middle East program of the Aspen Institute Germany and served in total for almost ten years as chief of staff and senior foreign policy advisor to several members of the German Bundestag. Recently, Mr. Böhnke was the founding Managing Director of the European Policy Unit at the Mercator Institute for China Studies (MERICS) initiating a high-level dialogue with European decision makers on the need for a more coherent China policy of the EU. Mr. Böhnke is an associate fellow at the German Council on Foreign Relations (DGAP) and a visiting professor for political sciences at the Free University of Berlin. Olaf Böhnke holds an MA in Political Science, International Relations and Economics from Freie Unversität Berlin, and speaks German and English. Henrik O Madsen has a distinguished career in business, leading DNV’s business in Japan for four years from 1993-1997, and serving as CEO of DNV and latterly DNV GL between 2006-2015. The company, with over 15,000 employees, provides services to industries including maritime, renewable energy, oil & gas, electrification, food & beverage and healthcare. A widely-published engineer by background, he is also a member of the UN Global Compact Board, and Chairman of the Board of the Research Council of Norway. In 2002, he was elected to the US Offshore Energy Centre Technology Hall of Fame as a Technology Pioneer. He advises on the expansion and delivery of Rasmussen Global’s business advisory services in Nordic countries. Jonas Parello-Plesner brings on board over 15 years of experience from the three power centres of Washington DC, Brussels, and Beijing from the fields of diplomacy, think tanks, development aid and business advisory. This unique combination can assist organizations in navigating the increasingly complex world where international politics and business overlap. Jonas can bring together diverse groups of people to foster innovative ideas and to create added value. EU-China relations and investments flows are one of his expertise. He has contributed with numerous briefs on EU-China trade and investment relations and the significance for business, including provided testimony both to the congressionally mandated U.S.-China Economic & Security Review Commission and to the European Parliament. He has co-authored a ground-breaking book on China’s protection of nationals and assets in fragile states and what increasing its Global Risk Map abroad for its companies entails for China’s strategic thinking. Jonas Parello-Plesner has worked on risks for business from foreign policy decisions including US sanctions and in Washington provided business monitoring of the Iran-nuclear agreement. Jonas speaks fluent French, English and Danish as well as good knowledge of German, some Spanish and basic Chinese. He holds a Msc in Government from London School of Economics (LSE), a diploma from Ecole nationale d’administration (ENA) with the grade ‘tres bien’ and a Msc in Political Science from University of Copenhagen. He has contributed with op-eds for The Financial Times, and has been quoted in numerous respected media. Jana Kobzova is an experienced professional within the field of international affairs and policy advocacy. Before joining Rasmussen Global, Jana Kobzova worked for the Brussels-based European Endowment for Democracy, where she developed and oversaw the EED grant-making in Eastern Partnership with a focus on Ukraine and Georgia. Prior to that, Kobzova was a policy fellow and coordinator of the Wider Europe programme at the London office of the European Council on Foreign Relations, writing analyses and managing ECFR advocacy efforts on Eastern Europe. Between 2006 and 2009 she led the Belarus democratisation programme at the Pontis Foundation in Slovakia. She has co-authored several books and reports on Eastern Europe, democratisation and the post-Soviet space and continues to write about the subject as an associate fellow at ECFR. Jana Kobzova has an MA in Politics, Security and Integration from the School of East European and Slavonic Studies at University College London. She also holds an MA in Political Science from the Comenius University in Slovakia. James Holtum has over a decade of experience in European and international communications. Before joining Rasmussen Global he served as Spokesman and Head of Communications for the European Conservatives and Reformists Group in the European Parliament. During this time he managed a group of international press officers, and devised and executed the group’s media and digital communication strategy. He has also worked as head of media for the UK delegation of the EPP Group in the European Parliament, the largest political grouping. Prior to this, he worked with UK Conservative politicians on media and strategy, speech-writing, outreach and campaign advice. He has significant experience with media strategy, crisis communications, European policy, event organisation and managing complex international relationships. He holds a Bachelor degree in Politics from the University of Exeter. Patrick is a media and communications specialist with experience working in the European, Belgian, and international communications sectors. Prior to joining Rasmussen Global, Patrick worked as a communications consultant at a boutique Belgian communications agency. There, he developed media campaigns, social media strategies, and digital marketing approaches for a variety of clients with a focus on professional services and tech start-up clients. He also worked on ING Belgium’s social and digital team. Patrick was a Fulbright Scholar at the University of Ghent, Belgium. He has a Bachelor’s degree in International Relations and French from Tulane University. He speaks English, Dutch, French, and is conversant in Spanish. Harry Nedelcu has 8 years of experience in policy, research and analysis positions at international organisations in Canada and in Europe. Before joining Rasmussen Global, Nedelcu worked for the Policy Planning Unit at NATO, where he provided policy analysis and research support to the Private Office of the Secretary General. Prior to this, he was a lecturer at Carleton University and Concordia University, Montreal, Canada where for four years he taught on subjects related to comparative politics, security and defence. In 2009, he was a visiting researcher at the Swedish National Defence College. His work has been published in the Review of European and Russian Affairs and East European Politics and Societies and has been presented at over a dozen international conferences. In 2010, he published a book on extremist and populist politics. Harry Nedelcu holds a PhD from Carleton University, Ottawa, Canada in international relations and comparative politics. He also holds a Prince2 certification in project management. He speaks English, French, German, Romanian and has a basic-knowledge of Russian. Axel Cousin is a professional within the field of international law and international politics. After experiencing work in a law firm at Winston and Strawn in Paris, Axel Cousin specialized in trade through internships at the EU-Japan Centre for Industrial Cooperation in Tokyo and in the DG Trade of the European Commission in Brussels. He focused on Free Trade agreements and regulatory cooperation, especially in relation with Japan. Axel Cousin studied Law in Paris II – Panthéon Assas, including a year in Tokyo at Waseda Law School, and an LLM in “International Dispute Resolution” at Fordham University, in New York. Axel Cousin passed the bar exams of Paris and New York. He also holds a master degree in European Politics and Administration from the College of Europe in Bruges. Axel Cousin speaks French, English, German and has a basic understanding of Japanese. Mads Hoppe has nearly 10 years of experience as a personal assistant and is currently the Personal Assistant to Anders Fogh Rasmussen. Before joining Rasmussen Global, Hoppe worked as a personal assistant to one of the partners in a prestigious law firm in Copenhagen. Here he used his service skills to provide day-to-day management of the front desk, calendar management, travel and meeting planning as well as event planning. Mads Hoppe has previously worked at some of the most luxurious hotels in Copenhagen. Martina D. Ianev is Junior Advisor at Rasmussen Global. She assists in the firm’s business development and policy advocacy activities by performing politico-economic analyses and briefings. Furthermore, she provides inputs to the CEO’s ongoing activities. Prior to joining Rasmussen Global, she worked in the business-policy department of an interest group, where she assisted with public policy advocacy in Denmark and the EU. Her main responsibilities included political analyses and briefings within the field of public-private partnerships, focusing on how to improve business conditions for the association’s members. She has been active in the field of international and diplomatic relations for 5 years, contributing to several associations within the UN community. Martina D. Ianev holds a Bachelor’s degree from Copenhagen Business School, including a semester abroad at Boston College, U.S. She is currently pursuing a MSc in International Business and Politics at Copenhagen Business School. She speaks Danish, English, Bulgarian and has a basic-knowledge of French. Rasmus Grand Berthelsen is Junior Advisor at Rasmussen Global. He contributes to the firm’s projects and business development activities by undertaking economic and political analyses, as well as providing inputs to the CEO’s ongoing activities. Before joining Rasmussen Global, Grand Berthelsen worked for the Danish Green Investment Fund, where his main responsibilities evolved around customer relationship management and quantitative analysis, as well as providing internal intelligence for the board of directors. Prior to this, he worked at the Danish Geodata Agency under the Ministry of Energy, Utilities and Climate, where he contributed to policy and business development by undertaking economic analyses, developing business cases, and formulating policy reports and legislative material. Rasmus Grand Berthelsen holds a Bachelor’s degree from Copenhagen Business School, including a semester at Boston University. He is currently pursuing a MSc in International Business and Politics at Copenhagen Business School, and speaks Danish, English and German. Sandra Sørensen is a Junior Advisor at Rasmussen Global. She assists in the firm´s projects and business development activities by undertaking economic, political and security analyses, as well as providing inputs to the CEO’s ongoing activities. Prior to joining Rasmussen Global, she worked in a macroeconomic- and geopolitical consultancy firm based in London, where she mainly provided input on analysis. She also took part in a larger research project on energy security at the University of Copenhagen, where she was responsible for analysis among the Nordic countries. Sandra contributed to an op-ed on energy security in the Norwegian newspaper ‘Morgenbladet’. Furthermore, she has experience initiating campaigns, as she was an active member of Amnesty International throughout her bachelor’s degree. Sandra Sørensen holds a bachelor’s degree in International Political Economy from City, University of London. Through her thesis, she specialized in the risk management of the Norwegian Sovereign Wealth Fund´s portfolio. Sandra is currently pursuing a MSc in Security Risk Management at the University of Copenhagen. She speaks Norwegian and English and has a good understanding of Swedish and Danish.